There are literally hundreds, maybe even thousands, of different wood cleaning and sealing products out there. How does a homeowner choose what exactly to buy to protect a wooden deck? Effective deck defense requires some thought and consideration. Investing time and energy to protect your deck early on will save you money in the long run, not to mention the hassles that come with dealing with a cracked, checked, discolored, warped, and dried wood deck. Contrary to what many homeowners think, you CAN preserve the beauty of your wooden deck. There are several kinds of cleaners and finishes out there, but one thing you should never take for granted is the type of wood sealer to use. In the world of wood sealers, the WoodRx Ultra Transparent Wood Sealer is a distinguished product that homeowners in the know trust. If saving time is important to you, then you’ll be glad to know that this sealer can be applied in just ¼ of the time compared to others. Even better, it lasts up to 5 times longer than traditional wood sealers! The WoodRx Ultra Transparent Wood Sealer boasts of many qualities that set this product apart from the other sealers out there. For one, the technology that went into making it isn’t used by other competitors. It also utilizes an innovative silicone and acrylic blend that never requires stripping, and never peels, either. Second, unlike other sealers that use waxes to produce water beading, this one gives you permanent water repellency. In fact, it’s the only water-based, transparent wood sealer of its kind that can effectively be applied with a pump sprayer. This effectively reduces the tools you’d need to apply it while saving you hours normally involved in applying traditional wood sealers. Let’s talk about results: when you apply WoodRx Ultra Transparent Wood Sealer, your wood is given an elegant look thanks to its sheer and transparent formula. In other words, it enhances the natural look of your wood investments – all while improving durability for the long term. But looks aren’t everything. What you need in a wood sealer is excellent protection and that isn’t negotiable. And the good news is performance is also where this product stands out. It’s resistant against mildew and protects against the damaging rays of the sun. Once applied, your wood enjoys permanent water repellency – not many sealers in the market can brag about this. Depending on the kind of wood you use, you may have to purchase a specific sealer for it. But this product can be used on all kinds of wood and performs well in all climates including temperatures that are just above freezing. When you use WoodRx Ultra Transparent Wood Sealer, you and your family can look forward to years of enjoying your wood deck. Foot traffic, cold and hot weather, rain, and the sun’s rays can’t hold a candle to the protection offered by this sealer. There is simply no other product like it out there. As a bonus, this sealer is environmentally friendly which means that you don’t have to worry about using harsh chemicals that can pose a hazard on you and the plants around your yard. When we read about all the incredible features of the WoodRx Ultra Transparent Wood Sealer, it sounded too good to be true. But when we checked what customers had to say about it, we were glad to know that the brand’s claims aren’t unfounded. Homeowners and contractors alike all have many good things to say about this sealer’s performance and wonderful results. Based on online reviews, homeowners say that applying WoodRx Ultra Transparent Wood Sealer within a few minutes is a breeze. Most of the reviews actually point to its ease of application as a winning feature, but they also commend its performance and terrific results. They barely noticed any wear and tear in their wood months into application. Homeowners also vet its superior water repellency qualities. Overall, when it comes to coverage, speed, and performance, it’s clear that the WoodRx Ultra Transparent Wood Sealer is a winner. A few customers were disappointed with how this sealer performed with certain types of wood, such as cedar. Though it was easy to apply, they said it didn’t last long enough. It seems that if this sealer is applied correctly following its directions, there should be no issues using WoodRx Ultra Transparent Wood Sealer. Getting your own WoodRx Ultra Transparent Wood Sealer is even easier than applying it. Browse your favorite online retailers to have this sealer delivered to your doorsteps in a few days. Amazon is known for superb service so you might want to check it out too. Keeping your wood decks looking and performing great for many years isn’t rocket science. 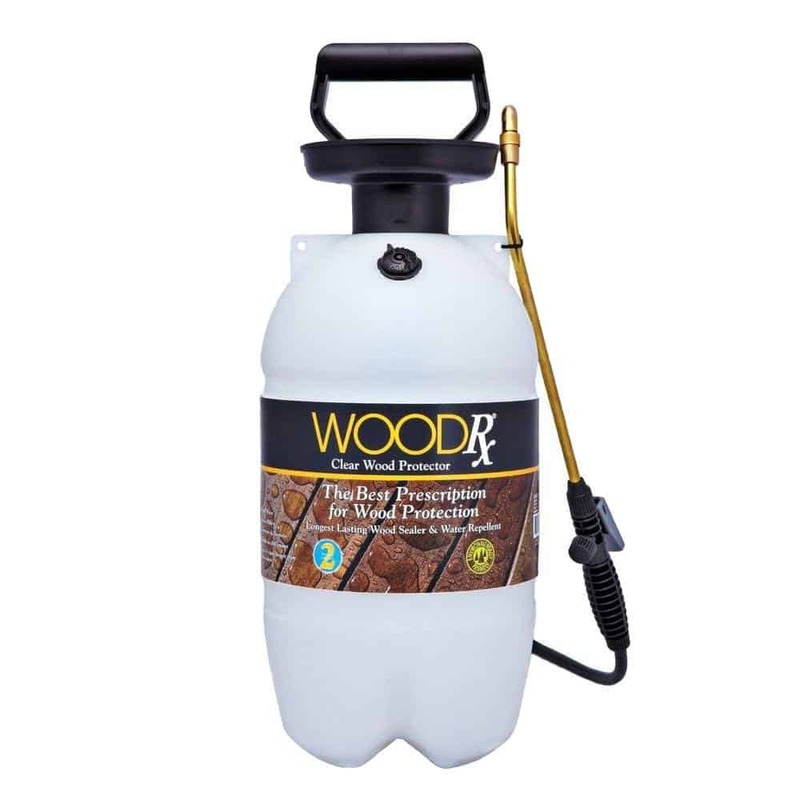 WoodRx Ultra Transparent Wood Sealer makes wood maintenance and cleaning easy – and that’s why so many homeowners trust this product. Don’t be left in the dark.